Our family gathered round the table over a late summer treat of fresh peach pie recently and debated the virtues of pie versus cake and discovered that we are unanimously a pie family. Good to know there won’t be disappointment from any quarter when dessert is served. 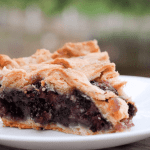 It’s not surprising really, since we’re learning the delights that come with seasonal eating and a good pie showcases the flavors of the season wonderfully. I can’t help but look forward to the day when the peaches in the pie have been picked, fully ripened, from a tree just a few yards from the where we sit to savor it. In fact, I planted a peach tree this year simply for the promise of making this pie with homegrown fruit one day. Yep. It’s that good and should be all the testimony it needs. 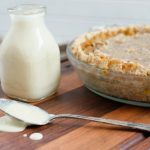 This Fresh Peach Pie recipe is my favorite. First, it is silly easy to make by slicing peeled peaches and then gently tossing them in a flour-sugar-spice mix. 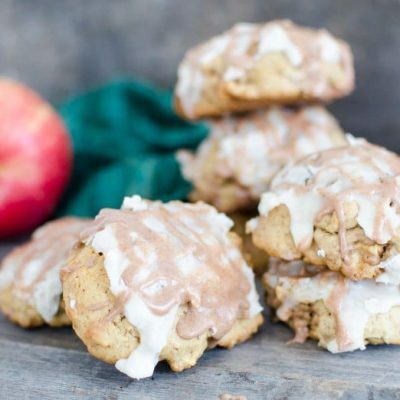 But it is also perfectly sweetened and spiced to allow the real flavor of the fresh peaches to shine through. I can’t abide by a mushy fruit pie. 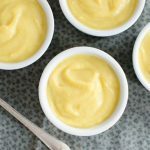 I’m weird about texture and my days of eating mushy foods passed when I was a toddler. Thankfully for me, between the thick slices of the peaches and the pie being baked to perfection the result is fruit that is soft and yet still firm. The pie crust is a real winner enveloping the peaches in a pastry that is both flavorful and flakey. One can always use a few more pie recipes, right? 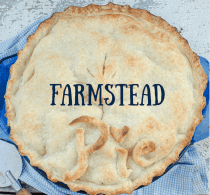 Check out our selection of beautiful and delicious, tried & true pie recipes in our cookbook, Farmstead Pie! 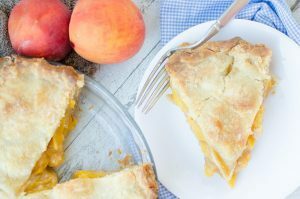 This Fresh Peach Pie recipe is perfectly sweetened and spiced fruit that is baked to perfection (no mushy fruit pies allowed!) 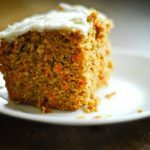 and enveloped in a crust that is both flavorful and flakey. I planted a peach tree this year simply for the promise of making this pie with homegrown fruit one day. Yep. It’s that good and is all the testimony it needs. Sprinkle the peach slices with lemon juice. Be gentle mixing in the juice. In a bowl, stir the flour, sugar, salt, and spices together. Pour it over peaches and gently mix once again. Spoon the peaches into the pie crust. Top them with a second crust and slit the top to vent steam. Bake the pie for 10 minutes then reduce the heat to 350 degrees and bake it for an additional 30- 35 minutes. Cool the down before slicing and serving, preferably à la mode. Peach is my favorite pie! Is the measurement for cane juice the same if you use sugar?